Correction: A previous version of this story misidentified Ukroboronprom's deputy director general of strategy. The position is held by Artur Kheruvymov. GOA, India — In a very quiet move, Ukraine has launched an aggressive offensive against Russia to manage multiple overloaded armaments and weaponry which New Delhi acquired during the "Soviet era" and have become a liability for the Indian defense forces. GOA, India — Ukraine has launched an aggressive effort to manage multiple overloaded armaments and weaponry that New Delhi acquired during the Soviet era and which have become a liability for the Indian defense forces. Armed with the salutations of a government-level delegation (to negate the strains in the relationship between the two countries since Ukraine sold T-80 U tanks to Pakistan in the early 1990s) and with over a dozen defense companies showcasing new programs at Defexpo, Ukraine is attempting to embrace India and break the Russian monopoly on the Soviet-era platforms. Perto Fedoruk, chief adviser to Ukraine's largest defense industry consortium, Ukroboronprom, said: "We are here now [in] India for the long term to manage Soviet-era headaches, which India cannot manage alone." "For nearly a decade Russia has forcefully blocked our entry," Fedoruk said. "We have offered multiple solutions to give new life to Soviet-era weaponry [with Indian defense forces], as we are the original equipment manufacturer." A senior Indian defense procurement official at Defexpo said that "Managing Soviet-era armaments with us is a big challenge and we are talking to everyone including Ukraine to overhaul and modernize," a senior Indian defense procurement official at Defexpo said. According to a Ukrainian diplomat, "India cannot resolve the headaches of overloaded Soviet-era platforms without Ukraine." 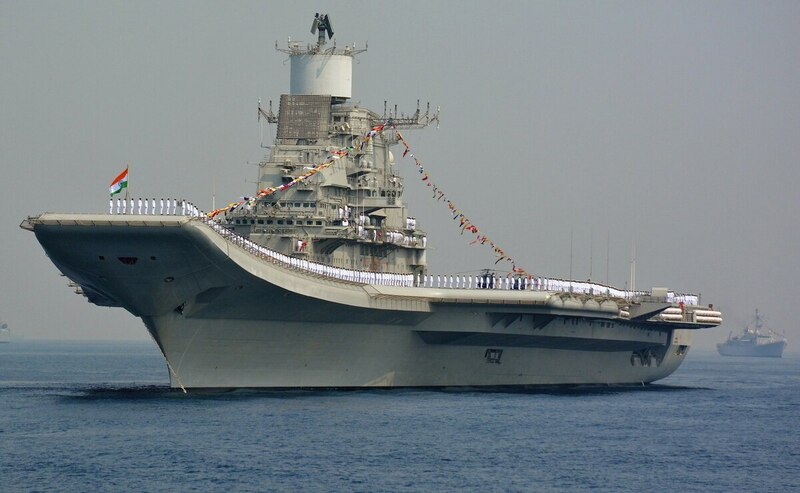 Nikolay Gordienko, head of Ukroboronprom naval projects, said: "India has now permitted us to participate in defense programs independently, and we are offering a new solution to manage and refit the Soviet-era aircraft carrier Admiral Gorshkov [renamed as INS Vikramaditya], which is 50 percent cheaper than the Russian offer." The Indian Navy is evaluating a proposal by Ukraine for overhaul and maintenance of gas turbines used in Delhi-class warships and the carrier Admiral Gorshkov. The Ukroboronprom deputy director general of strategy, Artur Kheruvymov, said India plans to organize a "joint military technical commission for providing service support for Soviet-era weaponry." "In addition, the two countries are also planning to form joint ventures in India for upgradation and overhaul and manufacture of spares for Soviet-built air defense systems, including the Kvadrat, OSA-AKM Strela-1, Tunguska, Shilka, portable IGLA and Strela-2 systems," Kheruvymov said. Ukraine is doing more than $100 million in annual defense business with India, and aims to increase it to $500 million in the next three years, he said. Over 700 defense contracts related to the delivery of spares, repair and upgrade valued at over $2 billion were signed and completed in the last 10 years. "We have now managed to make a breakthrough," according to the Ukrainian diplomat, who added: "India has now decided not to buy [the] electronic support measure system used to detect and track stealth aircraft and Vympel R-27 medium-range air-to-air missiles from us instead of from Russia." Ukraine has also offered to collaborate with India's Defence Research and Development Organisation (DRDO) to jointly develop multiple rocket launcher systems with a range of 100 kilometers — similar to Russian Grad systems. "In addition, we will also be developing a variety of new electronic warfare systems with DRDO and a partnership has been sealed recently," Fedoruk said. Ukroboronprom is also sealing a partnership with state-owned Ordnance Factory Board (OFB) to indigenize Russian T-90 main battle tanks and set up a facility to manufacture spares in India. Ukraine has also entered into a partnership with state-owned Hindustan Aeronautics for supply of crucial spares for Russian Sukhoi aircraft.